The Joint Commission Working Group on Underrepresented Groups in Surveying organizes a workshop on Monday May 24 with three presentation and discussion. In the afternoon will be a session concerning young surveyors. I am looking forward to meeting you in Athens. What is netSurve and who is it for? NetSurve is a web based global network for women employed in Surveying. It's a forum for discussion, for sharing experience, for access to examples of best practice such as mentoring, and for support. It's a link for those with similar aims, and it's a point of contact for those doing research in the area. It will disseminate examples of best practice around the world. It will provide links to other female friendly initiatives. There will be regular updates of topical research. There will be ongoing debates about current issues that anyone can join in. The network will develop in a style according to the wishes of the members, so suggestions will be welcomed. There will be a virtual conference in June 2004. It is a forum for anyone involved in surveying anywhere in the world at any stage in their career. You may be working in mapping, valuation, quantity surveying for example or working in Hong Kong, Sydney, Boston or Basildon. It's for you. The web gives us a unique opportunity to find out what is happening in our professional sphere in countries other than our own. We can explore differences and similarities. We can learn form each other's experience of surveying. If you have any suggestions about what you would like to see on the NetSurve website, please email us (netsurve@shu.ac.uk) with your ideas. We'd like to start our website with a virtual conference, as a means of getting as many people in touch with one another as possible. The conference will have three themes, The Past, The Present and the Future of Women in Surveying. We would like to hear about women's experiences in all aspects of surveying at any stage in their career from all parts of the world. We hope the conference will highlight our shared experiences and maybe also some unique ones, and that it will provide a platform for further discussion and debate. We aim to hold our conference over the period of one week, from 5th - 9th July 2004. People will be able to visit the conference to download papers and access discussion pages based on the themes of the conference and also to ask authors questions about their papers. There will be discussion opportunities throughout the conference period. As it is our first conference, we thought we would have three themes, The Past, The Present and the Future of Women in Surveying. There will be a videoed keynote presentation from a senior female surveyor which participants can play when accessing the conference. The conference aims to present the experiences, views, perceptions and opinions of women in surveying. The content of the papers can cover any area of experience such as; Women in surveying, what women think about working in the conservation of historic buildings, women's career paths, women's experiences of surveying education, worklife balance, networking, whether mentoring works, and so on. We would like to receive papers covering as broad a range of surveying experiences over as wide a range of geographical locations as possible. Who is it for and how to get involved? 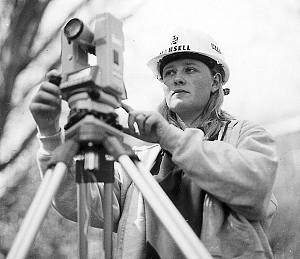 We would like to hear about women's experiences in all aspects of surveying at any stage in their career from all parts of the world. So the conference will appeal to everyone, from female students to experienced practitioners. We hope this conference will highlight our shared experiences and maybe also some unique ones, and that it will provide a platform for further discussion and debate. You can register for the conference now, and see information about how to participate. Access details for the conference will be sent out in June. We intend on following up on this conference with further virtual conferences but would like participants to suggest themes for future conferences and also when the best time for holding a conference would be. The call for papers has now been made - please inform anyone who may be interested. The papers will be refereed by a panel of surveyors from around the world. If you would like to participate in the conference please complete the registration information on the website. You will be given a password to use when the conference goes live to access the papers and the comments boxes. There will be an opportunity for participants to ask questions to authors during the conference. These questions will appear in comment boxes and you will have the option to make your name known or to remain anonymous. You will also be able to make your location known as well. We would like to ascertain where people are from to find out if the network is a global one. The authors will address the comment boxes within a 24 hours period of their 'programmed' delivery (see conference programme details to be published prior to conference). The comments will be sent direct to your email address as well as appearing in the comment box. Feedback is essential, and as far as we know this will be the first time a global conference has been held focussed on the experiences of female surveyors. We will be asking participants to complete a questionnaire based on the conference and also on the website itself. It is our intention to continuously improve the site but we need your feedback to do so. So let us know if there are things you would like included or omitted from the site and the conferences. A copy of the conference proceedings will be available electronically on the website after the conference. NetSurve is an exciting development and offers a great opportunity to share experiences, views and ideas. Please visit the website and let us know what you think. Danish chartered surveyor Karin Haldrup has had the opportunity to pursue an untraditional career path stimulated by many interesting assignments abroad. She was trained as a chartered surveyor at the time of transition from the traditional survey education at the Royal Agricultural University of Copenhagen to the current modern system at Aalborg University, where she graduated in 1978. After a period of work with mapping and cartography, she later developed a keen interest for the core professional areas of chartered surveyors: land reform, land registration, and land administration. She has been active in the Danish Association of Chartered Surveyors and has been taken active part in many FIG meetings and other international events. Her first assignment abroad was in Western Samoa, in the South Pacific, where she worked for 3 years as a UNDP associate expert in cartography preparing census maps and statistical mapping. After the Samoa job, she took a M.Sc. in Cartography at ITC in the Netherlands in a stimulating professional and international atmosphere. In 1985 she began working for the Danish company Kampsax, where she was engaged in modern mapping and in a wide range of consultancy projects. During the dynamic period of digital reform in Denmark in the 80's, she was engaged in map production, GIS, and product development in different settings in the private sector. She participated in various aspects of R&D, standardisation, and coordination efforts in Denmark. She was also active in the Danish Cartographic Society, e.g., as a contributor and an editor of its journal. In the beginning of the nineties, Karin Haldrup took an interest in the huge privatisation reforms in Eastern Europe and the former Soviet Union, inspired by the work of fellow Dane Carl Andreas Koefoed, the driving force of the Stolypin Agrarian Reforms in Russia prior to 1914. The reforms made work with cadastre and land registration more interesting and challenging. Thus, in 1991 Karin Haldrup took an initiative to launch in the Danish professional community of surveyors international activities in land reforms and land administration, resulting in projects implemented by the private sector. She was instrumental in preparing and managing a number of large projects in the Baltic States, covering both assistance to land reforms, and more technical activities such as e.g., GIS-development and gravity surveys. From 1992 to 1998 she worked on several projects in support of land administration in the Baltic States and Eastern Europe (Romania, etc.). Since then Karin Haldrup has expanded her interest to the land reforms in Latin America. Thus, in 1999 she started up a new branch of Kampsax in Bolivia based on a contract for the execution of the INRA-land reform covering two million hectares. Later she and her team prepared the winning proposal and negotiated a large contract for a WB financed project in El Salvador on land registration. Other engagements have included project identification and appraisal missions for international donors in the area of land administration in Mauritius (WB), Cambodia (EU), Malawi (DK), Romania (EU), and Ghana (NDF), etc. Since 2002 Karin Haldrup has been working as an independent consultant in the field of land administration. In addition she has been working extensively on the problem of how to overcome the current shortage of data on land tenure in general, and how to interconnect data on people and on land. Her current work has been inspired by Ester Boserup, previously featured in this newsletter, author of "The conditions of Agricultural Growth, - The Economics of Agrarian Change under Population Pressure" published in 1965. Ester Boserup pioneered observations on gender and development. Sadly, Boserup’s early observations on women’s dispossession of land during transition to a specialised economy are as relevant now as ever. To ensure a better understanding and managing of the interplay between population pressure and land tenure, data has to be improved. Land tenure data is lacking in most developing countries. In many countries the only newer data set available at national level is the Census data. For this reason Karin Haldrup is promoting building of a partnership between statisticians and land administrators. She sees a unique opportunity for preparing the next census of Population and Housing to better incorporate questions related to land tenure, and to improve the data through better census mapping. Anyone interested in these topics is invited to contact Karin Haldrup and visit here website at: http://www.concensus.org/. Karin stated: "I would like to express my gratitude to all those individuals, whom I have been so privileged to meet and work with. I am indebted to them for the experience and the time they have generously shared with me." In a press release to state newsletters, John Emilius lauded the United States District Court of New Jersey for its July 2003 consent decree barring the state from enforcing its set-aside act for female and minority businesses. Citing violation of equal protection, the court’s decision was a victory for Emilius and his firm GEOD Corporation. A counterpoint reply to P.O.B. from this newsletter, scheduled to run in September of 1996, was cancelled when the trade journal’s female editor was suddenly replaced by a male. 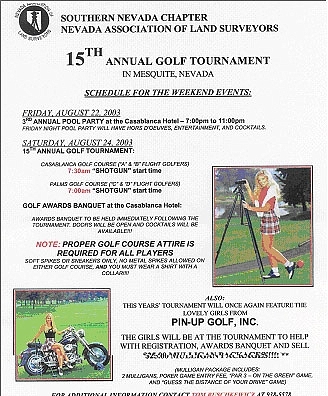 The affiliation with “golf girls” was yet another slap in the face for female surveyors, who for many years have been subjected to sexism on the job, at trade shows, and in trade journal advertising. This advertisement, which appeared last summer, demonstrates that female surveyors and mappers still face discrimination in their professional associations. Emilius, on the other hand, has complained for the past eight years that affirmative action such as set-aside programs should not be extended to women, claiming that most do not suffer from discrimination in the surveying and mapping profession. In his press release, Emilius outlined his own research of the New York and New Jersey departments of transportation (DOT) between 1995 and 2000. He found that of all DOT sub-consultants for engineering design contracts during that period, 80 percent were disadvantaged, minority, or women-owned firms. Of DOT land surveying and aerial surveying sub-consultants during that period, 95 percent were disadvantaged, minority, or women-owned firms. Represented by the Atlantic Legal Foundation, Emilius filed suit against the state of New Jersey and several of its officials, alleging discrimination on the basis of race, ethnicity and gender. He used the N.Y. and N.J. DOT figures to demonstrate that his own firm had suffered a loss of sub-consultant work as a result of set-asides. 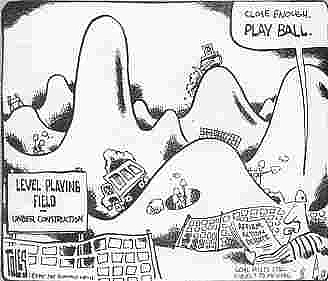 This award winning cartoon was originally scheduled to run as a counterpoint to the Emilius story in the trade journal P.O.B. eight years ago.